Copyright © IBM Corporation 2008. All Rights Reserved. A new wizard-like user-experience surfaced in its own new perspective that lets you browse and select coarse granular building blocks such as development practices for interactively creating a process without any special RMC knowledge or training. Process Builder is fully customizable allowing teams to define their own browse and select interactions for their specific content. 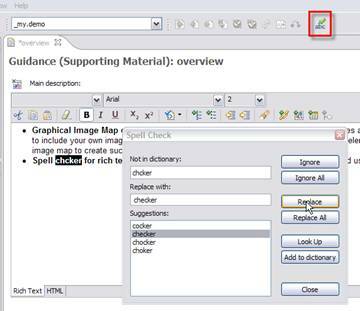 An enhanced Practice Guidance editor improves assigning arbitrary content element references that are then published in an organized common look and feel. RMC also provides a special publication skin called “RMC Compact” for Practices content giving you the choice to publish practices in a compact or fully detailed way. 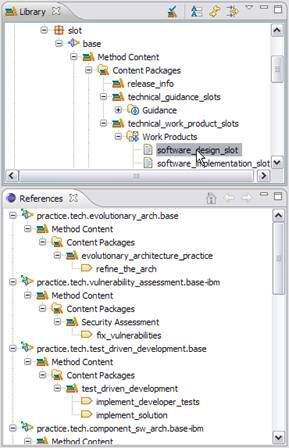 New modeling concepts such as abstract work products – referred to as Slots – and the Fulfillment relationships to decouple dependencies amongst method plugins that represent the content for independent development practices. For example, a set of slots defined in a base plugin can be systematically used as abstract inputs to tasks in dependent plugins without the need to define dependencies amongst such plugins. Slots are key enabler to model independent and individually selectable practices. String tags can be applied to any element and used for searching and browsing content in the RMC shell. Tags can also be used to define custom categories and filters on various publication mechanisms. Tags can be distributed using the Tag export and import functions. For example, you can tag a number of elements in your method library, including elements in IBM-provided content, and then distribute these tags as one or more tag groups to co-workers and clients without the needs to redistribute the entire method library. RMC provides tag-based means for defining filters on slot fulfillment (see above). Such a filter can narrow down the number of fulfilling work products for a slot based on commonly assigned tags between elements that have relationships to work product slots such as tasks or roles and the concrete work products that fulfill the slot. 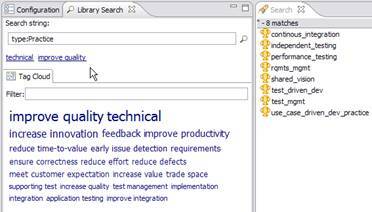 This capability helps designing ultra-small to very large method libraries using the same common set of work product slots. See “Product overview > Introduction to Rational Method Composer > Key concepts > Work Product slot fulfillment” in the online help for more details. Tags are available as meta-data in the published html pages as well as accessible for Skins via XSL. You can therefore create a skin that publishes tags or provide tags as xml to a server application. RMC now includes a fully functional IBM® Rational® Asset Manager client that has been extended to integrate with Method Composer to share, browse, download, and install method plug-ins and other method assets directly from an asset server with a few mouse-clicks. Go here to learn more about Rational Asset Manager: http://www.ibm.com/software/awdtools/ram/. The Library View has been enhanced to provide several new editing operations on custom categories such as Reassign, Unassign, or Deep Copy to easily change the category nesting structure or to copy entire category hierarchies with just two mouse clicks. Custom categories have been improved to allow defining categorizations via declarative queries in addition to the direct selection of elements. For example, you can create a custom category that lists all elements of the type Practice that have been tagged with the word ‘technical’ to provide a list of technical practices in your navigation tree. Method plug-ins can now be created by copying existing method plug-ins or by using one of the new method plug-in templates. Users can create their own plug-in templates or use an interactive wizard for creating specialized method plug-ins such as contributing plug-ins or late role-assignment plug-ins, which pre-populate plug-ins with computed element stubs. the ability to define and store all publication options and parameter in the configuration editor itself for rapid publication and interchanging configurations amongst users with all options pre-defined. The RMC Library and Search views have been enhanced with various new capabilities. User-defined filters for the Library view: the Library View can now be filtered to only show sub-sets of method plug-ins based on user-defined patterns. Less cluttered content package presentation: RMC organizes elements based on type within method content packages. RMC 7.5 now only creates type groupings if elements of such types actually exist in the package, resulting in a cleaner and less cluttered display than in previous releases. Quick Library Search and Tag Cloud view: A new view that allows you to rapidly search within a method library based on names, text, element types, and tags using a tag cloud. Added Search options: The Search dialog provides new options to define search scopes such as user-defined sets of method plugins, element types, or tags. 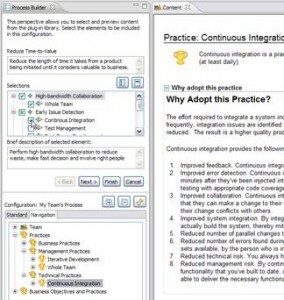 Full support for Eclipse Team Project Sets to interchange a workspace set-up within the team. A project set is a text file that contains a pointer to the location on a source code repository such as ClearCase or CVS of each of the projects contained in a workspace. When a project set is imported, these pointers are used to fetch all the projects from the respective source code repositories in one simple operation. 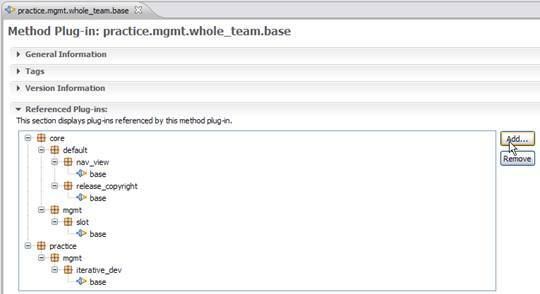 The new user interface in the method plug-in editor provides a more intuitive way to review and manage dependencies. The rich text editor now features a graphical image map editor that allows you to include your own images and to draw hotspots on these images. Just drag and drop elements from the Configuration view into your image map to create such a hotspot or draw a shape to create a link to any other URL. Plain and rich text form fields in RMC can now be spell checked using the built-in Spell Checker. You can now create activity diagrams with a horizontal left-to-right layout. Fork and Join nodes can be rotated supporting a vertical or horizontal control flow layout. You can define your own icons shape and node icons for almost all elements. 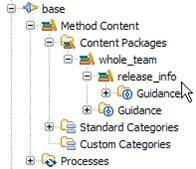 For example, assign a new shape icon to an activity or milestone to be used in an activity diagram. Use the new References view to review for an element selected in the Library all other elements in the method library that refer to that element. This will help you to quickly analyze how an element is used in your library and the impact changing the element would have. Images and file attachments that are not used any more by any element can now be easily removed by using the Clean Resources command in the Edit menu. For example, all artifact templates that have been replaced with newer versions, that are not references by your template guidance elements anymore, but are still stored in the library wasting space, can now be removed with this menu operation. Published activity and process pages now provide an Expand All button to fully expand the complete breakdown structure with one mouse-click. RMC provides a new field for all elements called External ID. Use this field to provide and publish your own unique identifiers for your elements. This field is switched off by default and can be added to the UI via a preference option. It is also made available to Skins via xsl. When publishing roles, tasks, and work products in a navigation view RMC automatically generates entries for sub-elements for the elements. 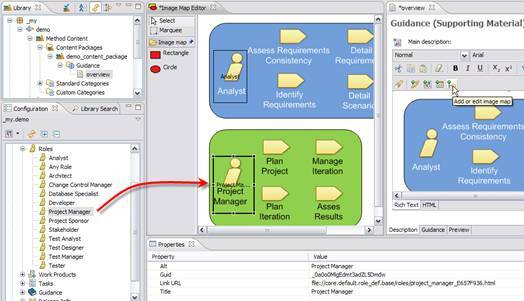 For example, RMC would publish a task element in the navigation view by creating child-elements to list the task’s performer and outputs. This new option allows switching this behavior off to simplify the tree view. The process usage section shows for every role, task, and work product in which processes and activities they have been used. Publishing this section has been extended in RMC 7.5 with more options to select which information should be shown here. You can now choose to switch this section off, to publish only the direct usage of these elements in processes, or to even publish all indirect usage of these elements via extended capability patterns. To improve the design of practice-based content we extended method plug-in to distinguish regular from supporting plug-ins. 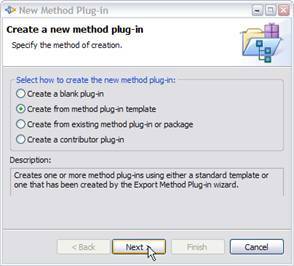 Supporting method plug-ins provide reusable content for other method plug-ins. 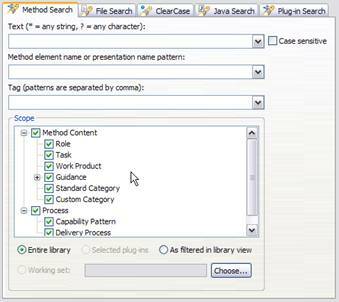 The content that is stored in a supporting method plug-in is only visible and published for a method configuration if other content that is not in a supporting plug-in references it. 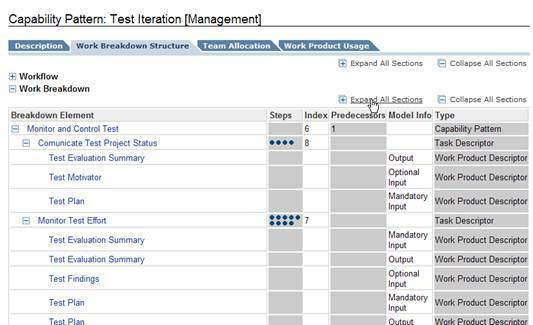 For example, you maintain a list of standardized work products for your organization in a supporting method plug-in. You only want to publish these work products when they are actually used by other plug-ins such as the ones that define the method content and processes for a specific category of projects. 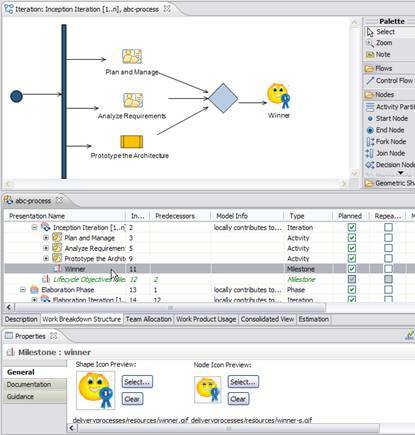 Hence, if any elements in these plug-ins such as a task modeling a relationship to such a work product as an input or output, then the work product will be published. Other work products of that supporting plug-in that are not used by your content will not be published. Milestones can now be associated with work products to indicate that such work products need to be delivered and/or reviewed for the milestone. You can now also directly assign guidance to the milestone, as well as assign new shape and icons to present the milestone in breakdown structures and diagrams. Changed the multiplicity of tasks associated to roles acting as primary performers for method content and process to many-to-many to support more variability scenarios such as alternative performers for roles. Changed the multiplicity of tool mentor guidance associated to tools to many-to-many to support assigning tool mentors to many tools to cover guidance for multiple tools (e.g. tool mentors describing tool integrations). Support for associating guidance to any breakdown element, in particular to support linking guidance to milestones and descriptors. Support for associating work products to milestones as specified in SPEM 2.0. Support for maintaining translatable presentation names for the method plug-in, content package, method configuration concepts. The online help has been updated and extended to describe all concepts and capabilities. 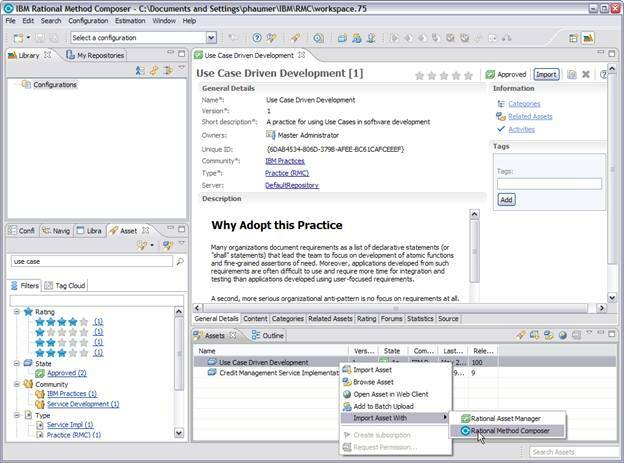 The content structure has been reorganized to prepare Method Composer to integrate and shell-share with other Rational applications such as IBM® Rational® Team Concert. It contains a new tutorial for creating and using Practices. It has a new start page that contains RSS feed readers showing the latest RMC Technical Support information and discussion topics in the IBM Developer Works Forums.